New Manning Secret Court Hearing! Are Assange's Days Limited? 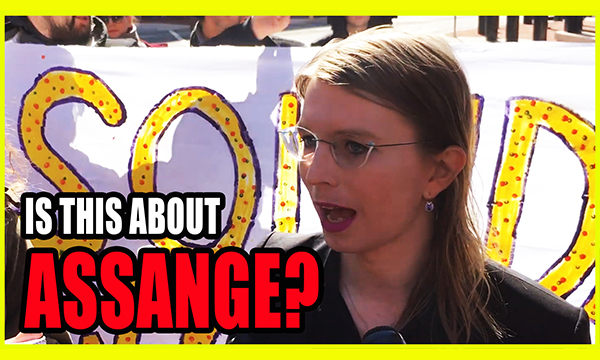 In this video Luke is on location at the Chelsea Manning hearing regarding what appears to be an investigation into Wikileaks founder Julian Assange. Watch Mannings reaction and commentary with Ford Fischer. Alright so this is a girl ask if we are change. Org here in Alexandria Virginia where Chelsea Manning just got off of the Virginia court system after subpoena. Four-course of secret grand jury indictment here she got her have some comments from her now. Everything matters is sealed basically just met with the judge. That’s been deferred to another time. That’s that that hasn’t been determined. You’re not allowed to have. Back to you you know. I need to head out. Apart from his there was a whole lot of government. Unfair because the solitary confinement that she had to face. For of course whistleblowing and releasing very important information support network here for Chelsea Manning and of course a bunch of journalists as well but Chelsea Manning was one of the most whistleblowers in American history and released a lot of important information about the Iraq War of course giving information of course Wikileaks this is why is the Shari’s also here’s another journalist on the ground and you know this has sent chills down a lot of people’s about saying it’s probably Wikileaks lot of people saying it’s already replaced and. What’s the bigger of kind. Information that people should know about the causes of course he still unclear Chelsea. It seems like he’ll see yourself doesn’t know exactly but on principles because of the secrecy of the process and so the secret. When Chelsea initially did these years and she got out and 7 after Obama commuted the sentence commuted the sentence down to seven years and she gets out at the time it was it was used in a way that it was a complete of the Iraq War fairly consistent and her stance on transparent and of course this kind of political process picture of course we had Barack Obama pardon Chelsea Manning. 35 years and she faced what people called unfair and unusual treatment of course solitary confinement for a very long time and I’ve never been released when Barack Obama did this even though Donald Trump said before that he loves Wikileaks we can be more indictments on top of Julian Assange been saying this for a number of years now there’s a secret indictment against the only signs as no doubt about it now there’s more information all the news organizations are coming out with this happening is additional which is under the Trump administration because of the closeness that. And that’s the kind of support that they had for each other verbally especially with Donald Trump announcing that he loves them and as you mentioned before nothing has changed has changed dramatically witches fascinating to see in some way whether he would even want us on to be extradited on it or not because he said the same time you problem so it seems like mixed messages. Instagram ads with New York Times sync support. The craziness of these situations because Chelsea if she gets tripped up if there’s a mistake and there’s a lot of the grand jury system a bigger system hear that. One of us secret grand jury is to make sure that people don’t flee as we know there’s a secret Grand at that route again to join decide what you want to at least I press be there a certain sense of accountability sure they would write her mind is not a partial it’s a prosecutor talking to a group of people. Especially when she’s facing of course as we saw Drunk In This Very courtroom is an interesting development case the shop may become valuable like later on but I highly doubt that they’re actually always got to give our special thanks..
Special thanks to Heather who I just ran. Verbally just take me with you guys. Hope you guys appreciate that and I hope you guys appreciate whatever he says I appreciate it don’t forget to love you guys. PreviousThe Truth About CPAC 2019 And THAT Trump Speech! NextCOMPLETE MELTDOWN! R Kelly Absolutely Loses It! The Bigger Truth Here!